Of course we are. There’s a chance there won’t be any seats left on the Ship & Anchor patio. 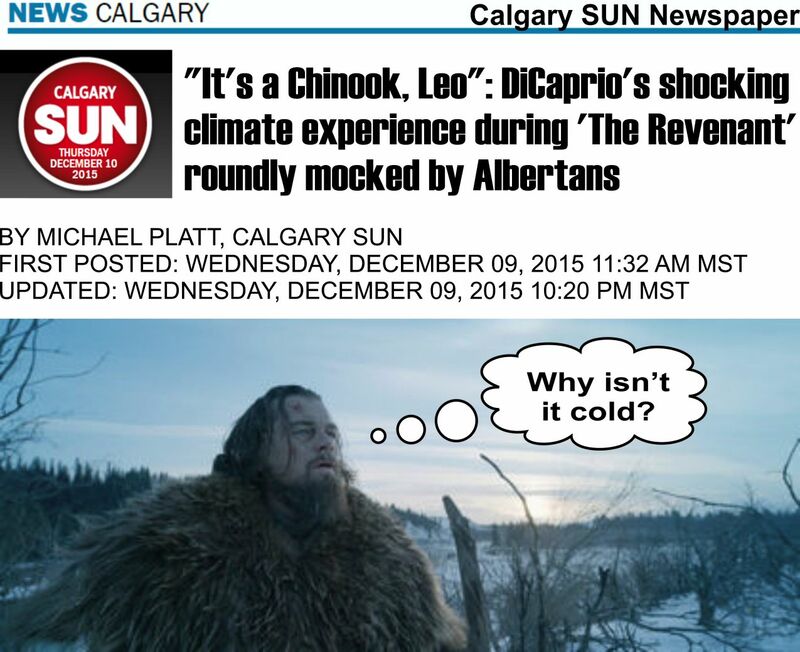 According to self-proclaimed climate champion and environmental leader Leonardo DiCaprio, warm chinooks winds have Calgarians cringing — not because there’s the possibility of low wiper fluid or a lack of patio seats, but because we’ve never seen the likes of it before. “We were in Calgary and the locals were saying, ‘This has never happened in our province ever,’” DiCaprio was quoted by Variety.com. Calling these unexpected, snow-melting winds “scary,” DiCaprio is now using the sudden weather changes he witnessed while filming in Alberta last winter as evidence of impending climate apocalypse. It would be hilarious, if the star of The Revenant wasn’t also the head of a multimillion-dollar environmental lobby group, the Leonardo DiCaprio Foundation, and a producer of documentaries on climate change. “You see the fragility of nature and how easily things can be completely transformed with just a few degrees difference,” DiCaprio reportedly told an audience at the SAG-AFTRA Foundation awards, using Alberta’s horrifying winter winds as proof. Of course, that’s like getting a sunburn in the Sahara Desert and directly linking your red skin to ozone depletion. DiCaprio’s overall climate concern may be valid, but the example cited makes him look like a complete idiot — especially for anyone who’s ever heard of a chinook. “Our team endured two unprecedented weather events that shut down the already-delayed and complicated production schedule, which I’m sure you’ve heard about,” said DiCaprio, who’s actually filmed here in Alberta before. Of course, there was nothing unprecedented about it. With temperature shifts of up to 30C in a matter of hours very common, chinook winds and their hallmark arch are anything but a cause for dread, unless you’re migraine-prone and sensitive to pressure changes. Last winter was actually pretty ordinary, as chinooks go. Rather than terrified, southern Albertans have celebrated the breezy break from the cold for centuries — just as long as people have lived east of the Rocky Mountains, it seems. 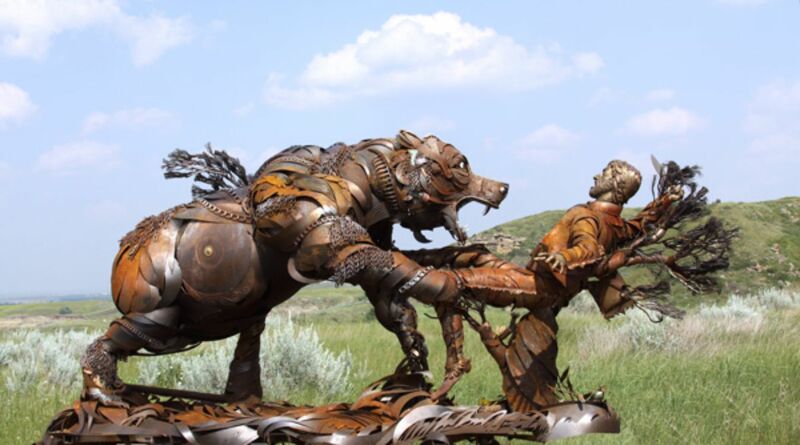 If DiCaprio really got his chinook misinformation from a local, the actor should be furious. He’s been duped into looking like a dim-wit, pure and simple. But if DiCaprio just made a broad assumption, or if he took an isolated local weather event and extrapolated it to be evidence of climate change, he deserves all of the scorn and ridicule he’s so far endured. And the mockery should come from every side. Once again, you have a spoiled, jet-setting entertainer using half-baked notions to promote a cause that’s trendy with the Hollywood elite, and like other famous folk before him, DiCaprio appears willing to twist the truth to suit his latest speech. For those really concerned about climate change, DiCaprio does more damage than good when he shows total ignorance of how weather relates to climate, while demonstrating a total failure to research even the most basic of facts. MFW comment: Well, I’m not so hard on Leo. There’s been plenty of folks baffled by our Chinook winds over the years. When you see somebody barbecuing in a T-Shirt in the middle of February and you figure it’s supposed to be frigid here, that might set you off a bit. 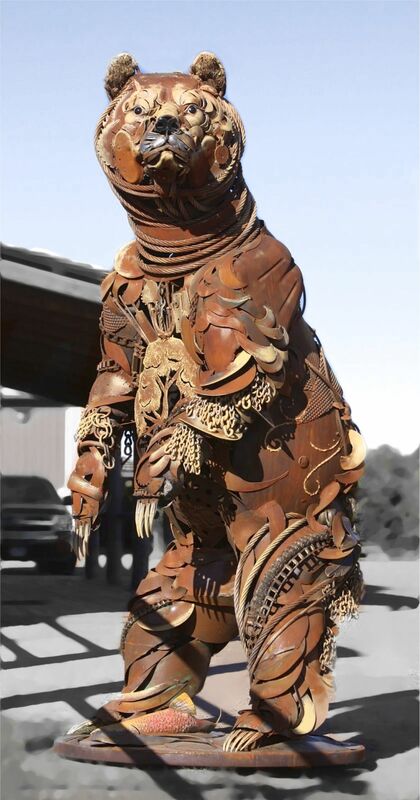 We Albertans are a also bit testy about folks attacking us for pollution and global warming and such – including a Canadian guy named Neil Young. Yes, we must be conscious of this stuff. And do what we must going into the future. BUT there were ice ages and periods of global warming long before us humans started screwing the place up. ??? – a person who has returned, especially from the dead. 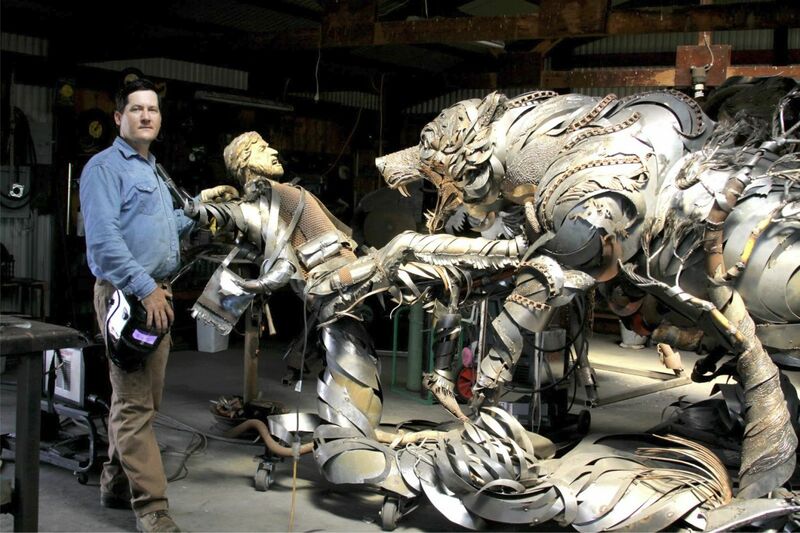 Tim (Tim Neath – Visual Artist https://timneath.wordpress.com/about-me/) was commenting that the upcoming film: “The Revenant”, is a remake of the 1971 film “Man in the Wilderness”which starred Richard Harris and John Huston. We were both puzzled at the lack of acknowledgement about this ? 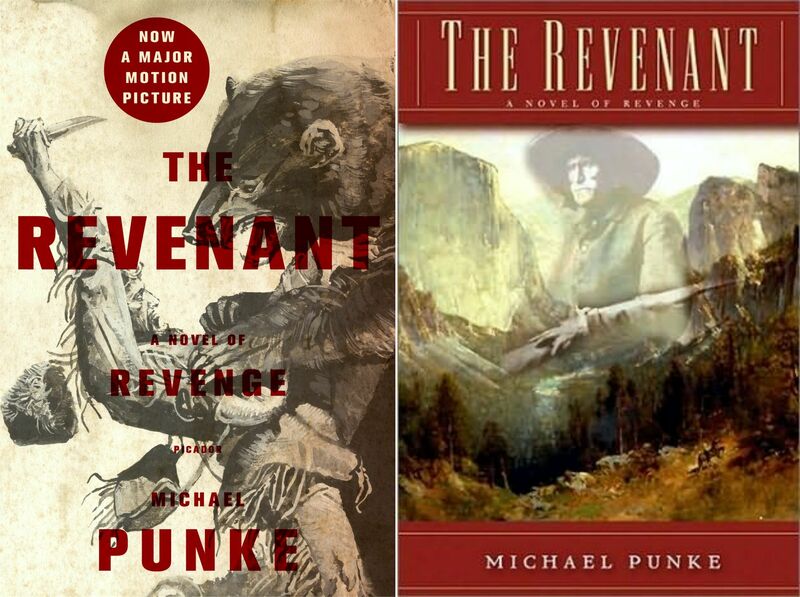 Looking at things a little closer, however, I see that the book “The Revenant” was written by Michael Punke and released in 2002. 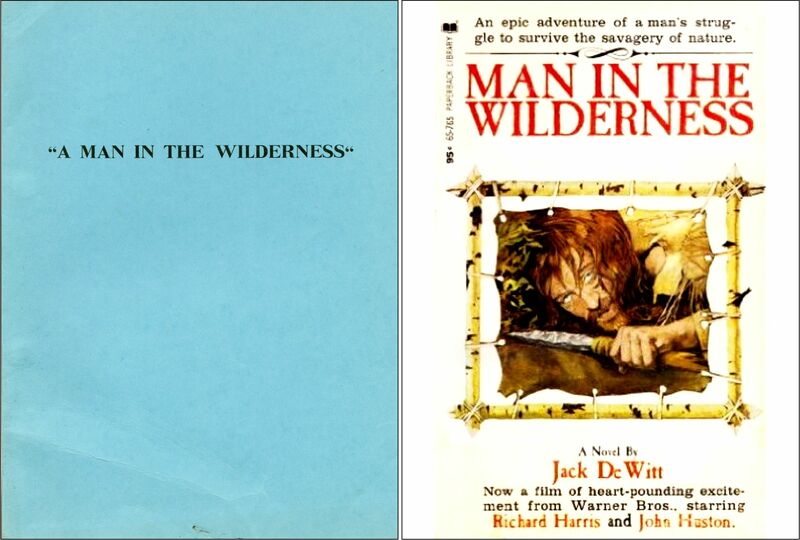 While “Man in the Wilderness” was a screenplay / script written by Jack DeWitt about 1970 – a novel was later released, named after the movie. In any event, it’s the same story – by different authors. Above: The (blue) script for Man in the Wilderness (1971). 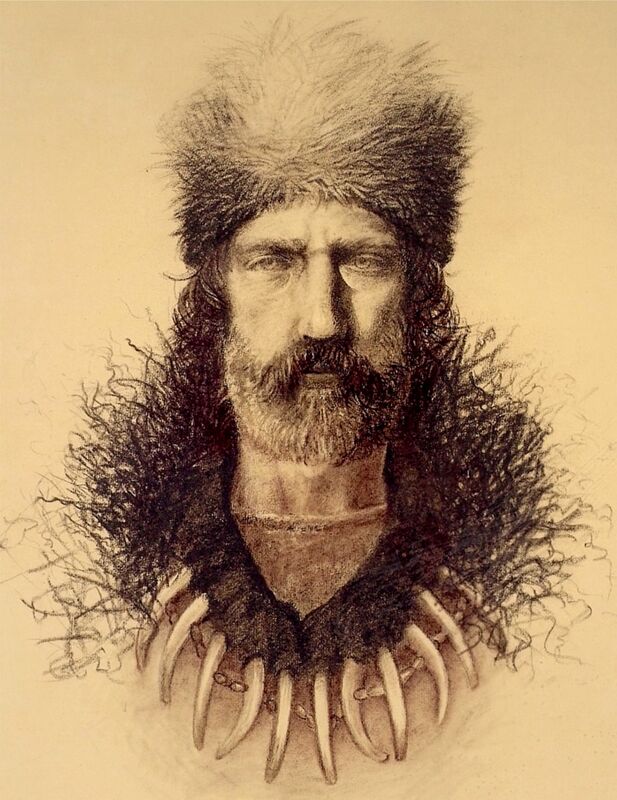 A biopic loosely based on the life of American frontiersman Hugh Glass (1780-1833). 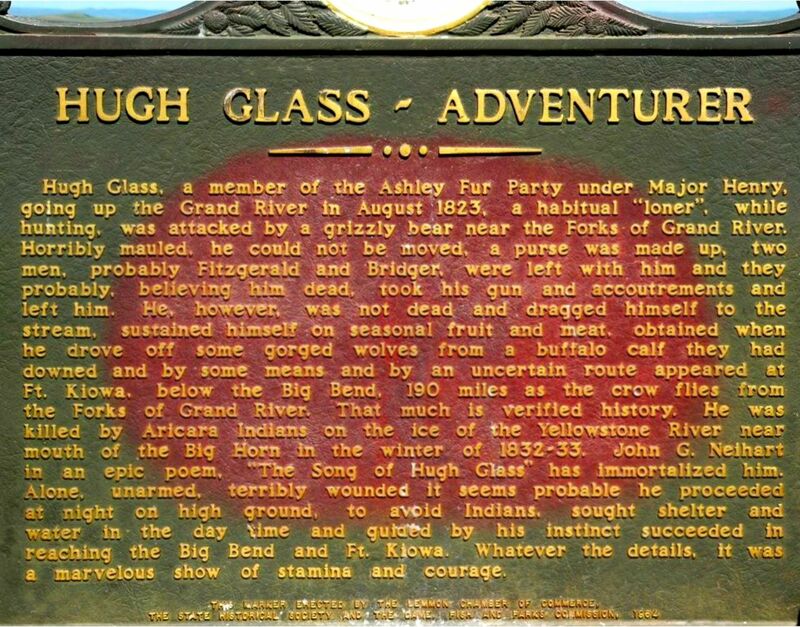 I’m guessing it follows the factual events of Glass’s adventures more closely than The Revenant, but the theme of being a revenge movie seems accurate. 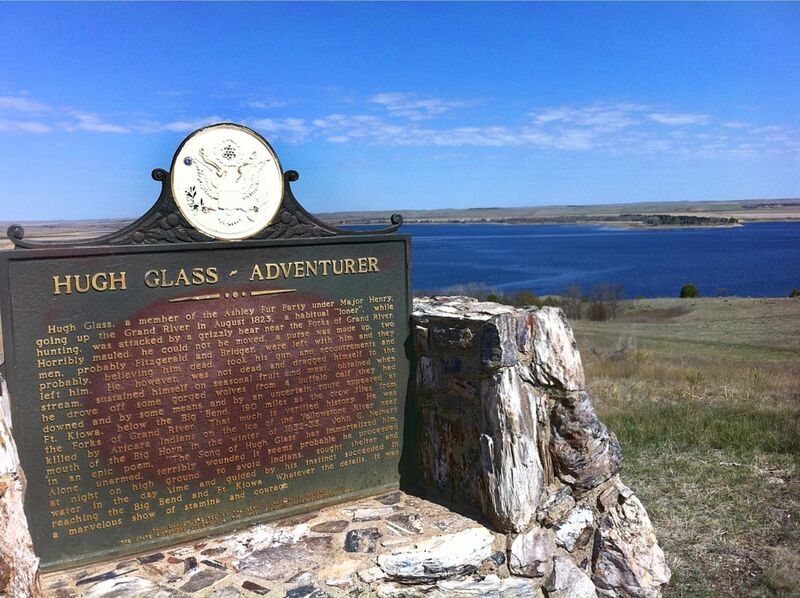 In real life Glass didn’t follow through on his vengeance – after he confronted the men and accepted their reasons for abandoning him. In Man in the Wilderness, Glass’s name is changed to Zachary Bass (not sure why?) and played by Richard Harris. Captain Henry is the antagonist played by John Huston, as the leader of the expedition members who deserted him. Though shot on location in Spain in the 1970’s, Man in the Wilderness has no feel of being a Spaghetti Western and I don’t personally qualify it as such. Others may differ. Nor would you guess that the locations in the movie are anything other that the Appalachians or Adirondack’s of the Eastern US. The terrain seems amazingly similar/authentic. 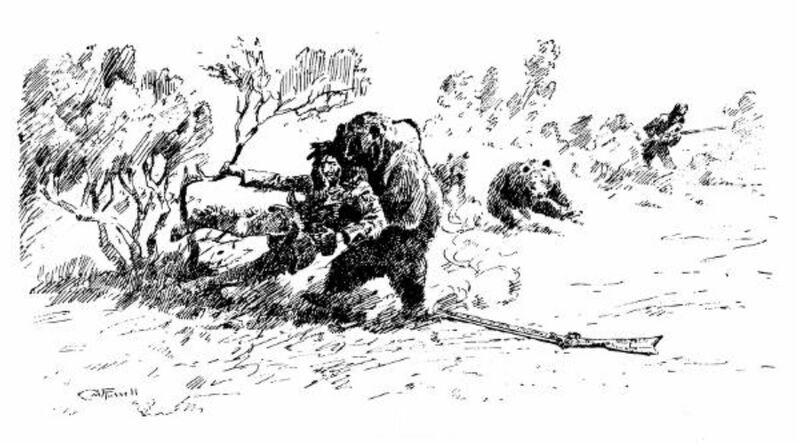 Strangely enough, The Revenant is also shot outside of the US – in Alberta and Argentina. ?? 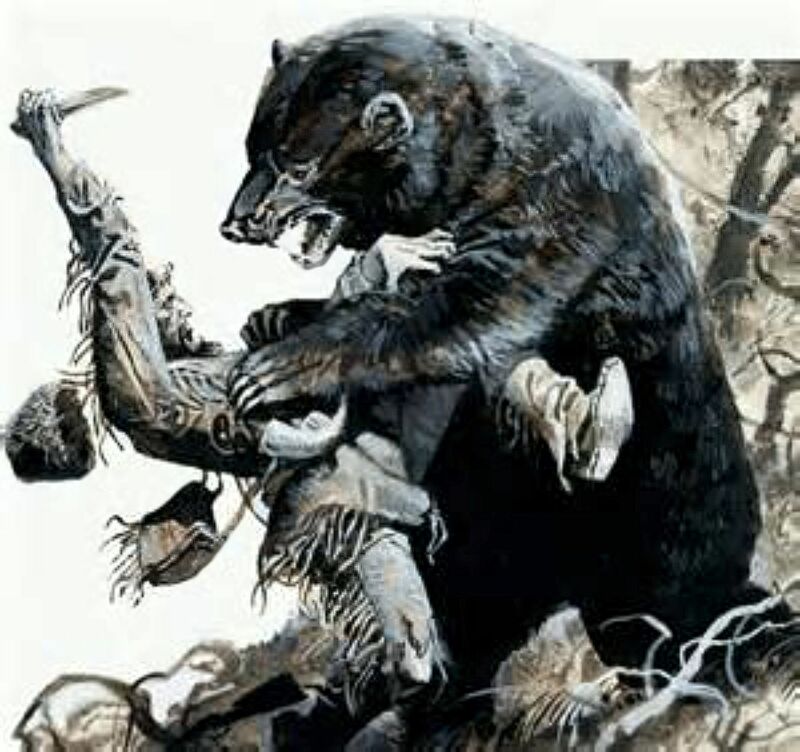 The Revenant book covers. Initial release 2002. What can we say? 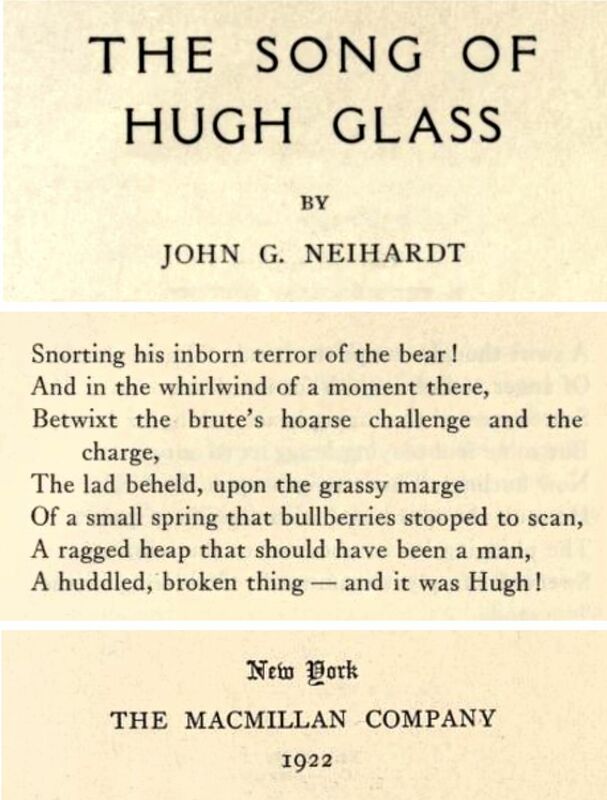 Hugh Glass seems to have been a hell of a man.